Distressed property is property that is in danger of being or has been foreclosed upon. Foreclosure or repossession is the legal process through which a lender attempts to recoup the balance of a loan, when the borrower fails to make scheduled repayments. The process involves the legal seizure of whatever asset was used as security against that loan, to force the sale of the asset. In the case of mortgages and very large loans, this asset will typically be property. Distressed property investment is therefore any property that is being held or sold by a lender because of repossession or foreclosure. In some cases, the term can also be applied to property that is up for a quick sale by the owners, because of them being unable to meet the costs of a mortgage or other loan. They may be attempting to sell the property to pay off the balance of their loan, before it is officially seized. Why do Distressed Properties Make Good Investments? Distressed property tends to be sold at a discounted price, often one that is well below market value. In cases where the owners of the property are trying to sell quickly to avoid foreclosure by lender, they will often accept very low offers from buyers, particularly cash buyers and first-time buyers. These categories of buyer are preferred, because a sale will usually complete much more quickly if there is no mortgage or no chain. Cash and first-time buyers are therefore in a very strong position to negotiate price on such properties. Distressed properties which have already been seized by the lender are also usually up for a quick sale. While the lender has a duty to get the best possible price for a property, there is no set period which they should allow for the sale. Most lenders will want to re-sell property very quickly, to eliminate costs involved with holding it and to ensure it doesn’t fall into a state of disrepair, thereby reducing the value. Distressed properties are often sold cheaply at auctions. Their below market value price tags often make them great opportunities for investment. What Situations Can Lead to Distressed Property Sales? Repossessed properties are simply those on which the foreclosure process is complete. They are fully owned by the bank and up for quick resale. If looking at buying a repossessed property, it is important to have a full survey done prior to bidding at auction. The winning bidder in an auction is legally obligated to buy the property they have won, and a 10% deposit is usually required upfront on the day of the auction. 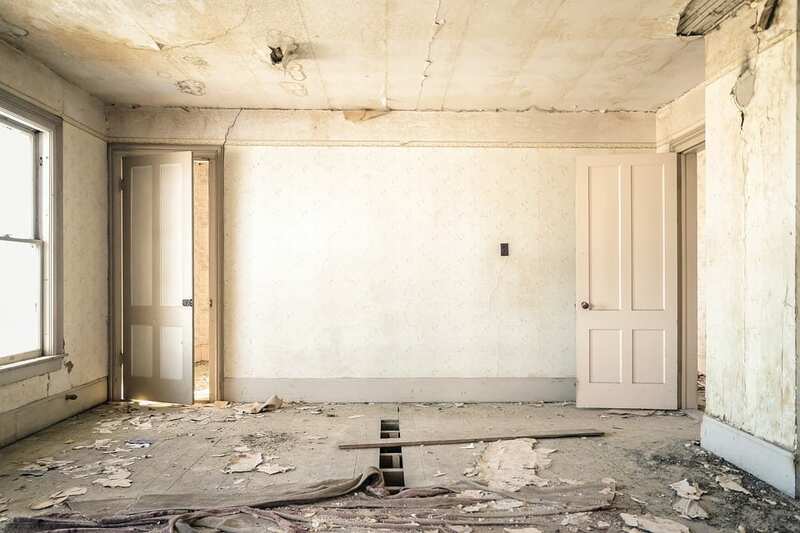 Repossessed properties have often stood empty for long periods of time whilst foreclosure was taking place, so the risk of them needing serious renovation is high. The costs of renovation can eat into any profit made through buying below market value. Financial distress generally comes about due to a change in circumstances. This may be redundancy, a pay cut, a long-term medical condition leading to an extended period off work, or any other factor that may result in a loss of or drop in income. Properties that are distressed for financial reasons are usually up for sale by the owners, who are normally looking to sell as quickly as possible, before missing a mortgage payment. Properties in a state of disrepair need work doing to them before they become habitable. This can often lead to them falling into the category of distressed properties. If the condition of the property is too poor for it to successfully attract tenants, a landlord may need to sell quickly due to an inability to meet mortgage repayments without a rental income. Properties are sometimes bought by investors or developers with the intention of doing them up and reselling them at an increased price. However, occasionally the budget for renovations is used up and work remains to be done on the property. In such cases, the owners are usually looking to resell quickly, as they are unable to let out the property until it is habitable and are losing money on mortgage payments every month that they hold on to it. These properties may also be seized and resold by lenders if the owner is unable to sell quickly enough. The most common way that death leads to a forced sale of a property is when the property in question is owned on a basis of tenants in common and one of the named owners dies. The deceased’s share of the property passes to whoever is named in their will or through intestacy where no will exists. In cases in which the remaining owner is unable to buy out the estate, they will need to sell quickly to release the equity of the property and ensure the estate is settled. If a property is owned by two parties on a joint tenancy basis and one passes away, the remaining owner may not be able to continue to meet mortgage repayments on their own. If a property is owned by an individual who passes away, if they do not have a will or the beneficiary of the will cannot afford to take on the mortgage, the property must be resold as an estate sale. Couples going through divorce or separation often need to sell a property quickly for financial or emotional reasons. In some cases, one party may leave the other unable to make mortgage repayments, leading to foreclosure. If someone needs to relocate for work, they usually have a deadline by which to sell their property based on the start date of their new job. The owner of the property will usually wish to sell quickly, to avoid having to pay two mortgages on different properties. In some cases, the owner will be unable to sell before the relocation goes ahead, leading to them being unable to keep up with mortgage payments on both their old and new property. This may lead to foreclosure by a mortgage lender. These are just a few of the reasons that properties may be under threat of foreclosure. In each case, it is likely that the distressed property investment will be sold below market value, so looking out for distressed sales can lead to great profit-making opportunities.